Are you looking for a new skateboard that’s compact, durable and just plain fun to ride? 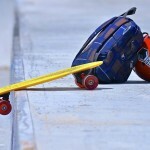 Penny boards encompass all that while also being affordable and looking great. Because they’re made of high-density plastic, these little boards are light but made to withstand a lot of pressure. 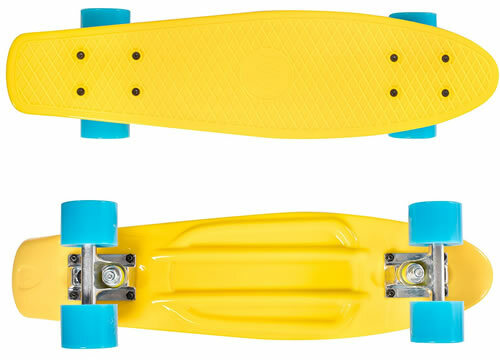 To help you find the perfect penny board, we’ve compiled a list of our top ten. No matter your budget or personal style, there’s bound to be one for you! This board is an incredible value. 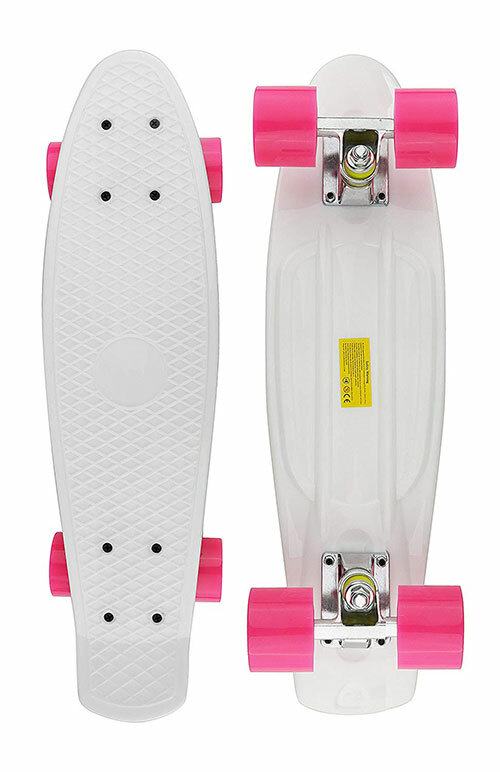 It’s super light, the plastic is strong and flexible and it comes fully assembled and ready to ride. With thick aluminum trucks and polyurethane wheels you get a smooth ride that really picks up speed when going downhill. One of the coolest things about the Rimable Complete is the sheer number of color and pattern options available. Whatever you’re into, there’s a board to match your interests or your favorite outfit. 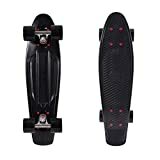 This is a great board for everyday riding, and if there are any issues, it’s been reported that their customer service is fast, efficient and helpful. 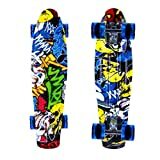 For under $30, this board is a great value. It’s 22 inches long and made of strong, flexible plastic that can support up to 190 lbs. comfortably. When you factor in that the board itself only weighs 3.7 lbs. that’s quite a feat! Some customers say that the wheels are a bit too tight, but loosening the nut seems to fix the issue. The color combos of this cruiser are awesome and really add to the retro feeling. 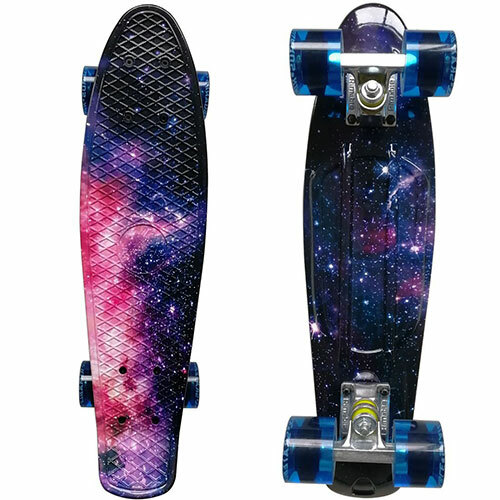 There’s even a glow in the dark option with LED-lit wheels so you can ride safely at night. For around $20, this board is a complete steal. 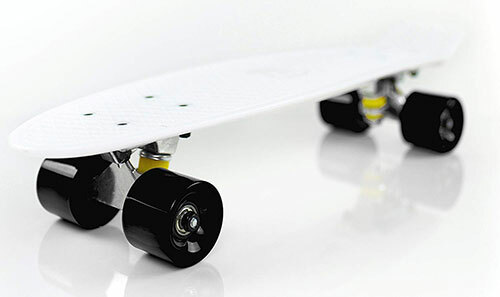 You get a fantastic, durable plastic deck with aluminum alloy trucks and polyurethane wheels to help absorb shock and provide a quieter ride. 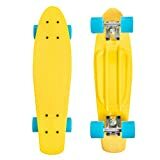 The retro styling and cool primary color combinations make this cruiser a fun ride for both kids and adults. If you find the wheels are a bit tight, or want to change out some hardware for customization, it even comes with its own allen key! The Boss Board is known for its smooth ride and sturdy construction, but where it really shines is the lifetime warranty. Use it, abuse it to your heart’s content and they’ll replace any part or material that might break. That kind of guarantee lets you know just how much they stand by their product. This board doesn’t come in a lot of colors, but everything is vintage-inspired for an attention-grabbing look. Because it comes fully assembled, you can unbox it and hop on to experience how much of a blast riding The Boss Board really is! 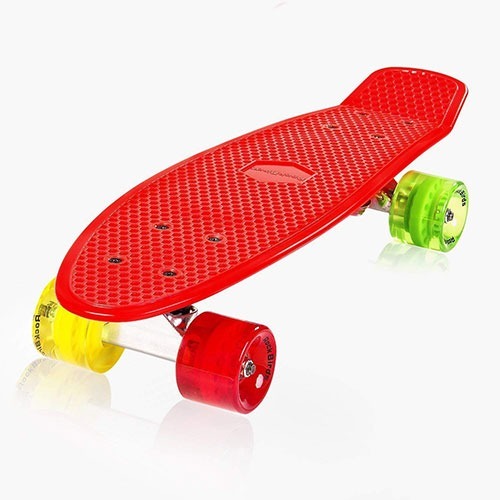 If you like quiet, smooth rides, the ABEC 7 bearings and polyurethane wheels on the High Bounce are perfect. You don’t get the traditional skateboard “growl”, and you go remarkably far with little effort. 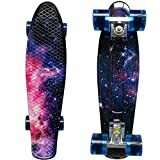 Add to that the super sturdy solid aluminum trucks and you have a cruiser that’s perfect for everyday riding. Because it comes in a bunch of fun colors and patterns, a lot of people tend to buy this board for their children. Don’t let that discourage you, however! It’s pretty functional and cool-looking for adults, too. 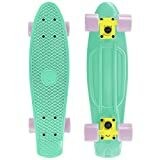 At 22.5 inches long and 6 inches wide, this is a slightly larger penny board than others on this list, but the good news is that it has really big wheels to match. They’re wide and softer than your usual skateboard wheels to absorb impact with ease. You have some unique color options with this board. 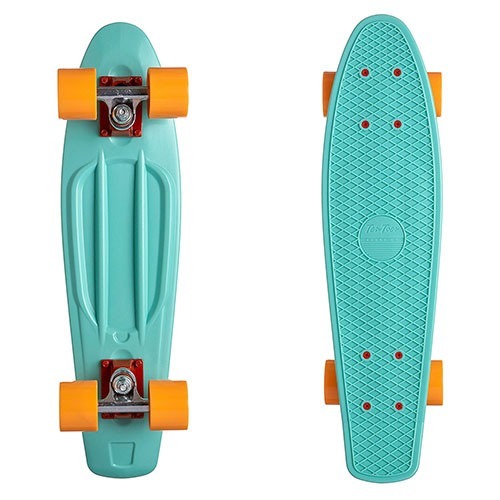 The retro inspired shape has an elevated tail for doing simple tricks, though it’s a better choice for simple cruising. This cruiser weighs in at less than 3 lbs. so it’s one of the more portable ones featured here. The deck is pretty thin, but still sturdy with a fantastic waffle-patterned grip. It’s only recommended for riders up to 176 lbs. 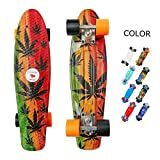 so it might not be suitable for everyone, but if you are looking for great color combos and a board you can throw in your bag without getting too tired out, it’s perfect. It might take a few hours of riding for the bearings to loosen up and the wheels to spin flawlessly, but you’ll be able to hop on right after taking it out of the box! The vinyl deck has a deep waffle grip, with polyurethane wheels and great bearings, so you get a super smooth ride that picks up speed quickly but don’t need to worry about your foot slipping off. 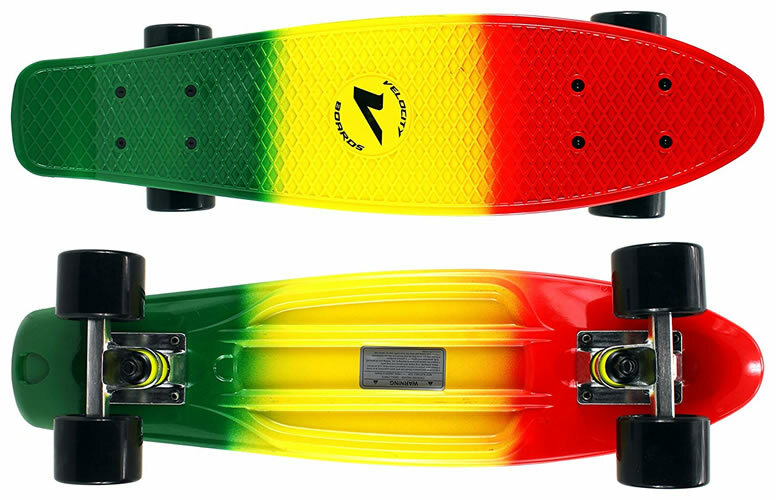 This board comes pre-assembled, and ready to find your balance and ride. The polymer deck has more give than some of the others featured here, so while it’s sturdy it can be a bit uncomfortable if you prefer a board with more stability. However, it does turn pretty well and has extremely smooth wheels. 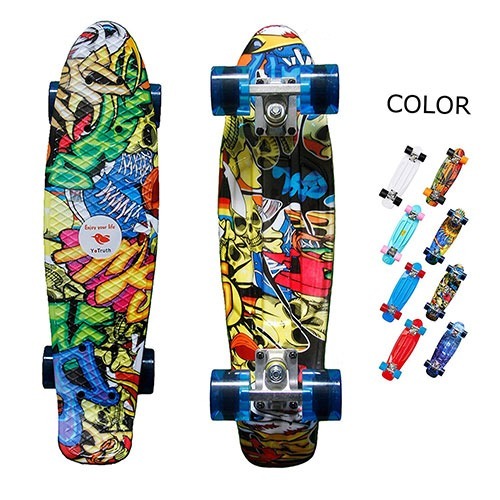 This board has some really fun prints and color combinations. The best part of the RockBirds board is the wheels. The multi color translucent look is really cool and unique so you’ll stand out among the crowd. The trucks are also pretty good, but the bearings could be better. However, for how great the rest of the board is, replacement bearings are a small price to pay for such quality! 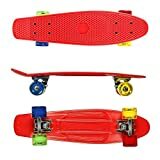 No matter which of the above penny boards you choose, you’re getting a great-looking and durable little cruiser that’s perfect for everyday riding. They’re all incredibly light, so just throw one in your backpack and you’re good to go!